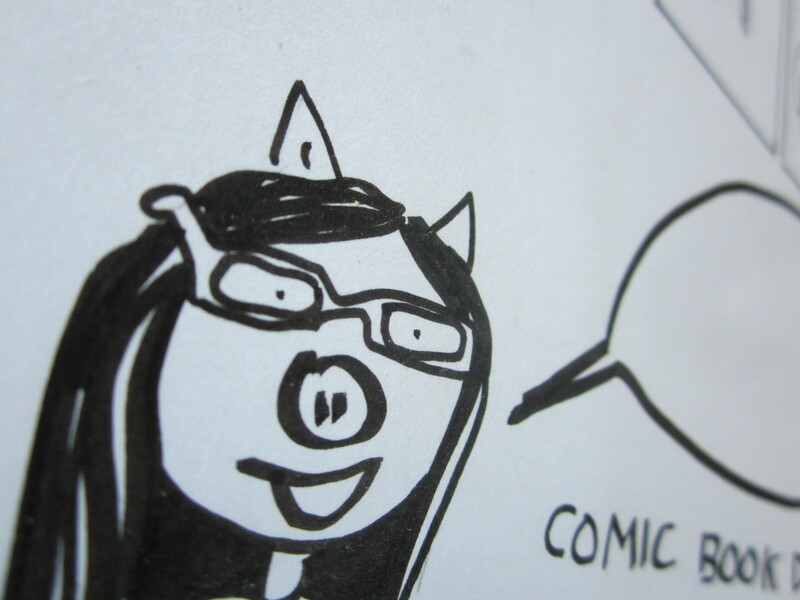 The class I taught last year was listed in the school syllabus as “Drawing Heroes and Villains, Pigs and Wolves. 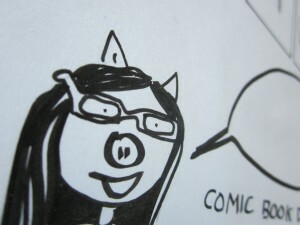 Illustrating Comic Books 4th and 5th grade.” I co- taught the class with Jessica Whitmore. She taught “Heroes, Villains and Conflict: Comic Book Writing”. She taught writing, I taught drawing. The first item on my lesson plan for the first day of class was to teach the students how to use a knife, fork and spoon. I brought the utensils to class, and made a rough sketch of the concept to prompt me when I taught the lesson. “Today we are going to learn how to use a knife, fork and spoon.” I held up the knife, fork and spoon . “Would you say you are skilled at eating? I wanted to freeze time, and have that moment in space and memory stop. I wanted to take a giant erasure and erase his comment in his speech bubble in the illustrated comic book of his life. I would take a black felt pen and ink with permanent ink, I can draw. He was in my class last year. I thought there might have been other students who thought like him. Students who had been told they couldn’t draw. Students who believed that the person sitting next to them was better at drawing then they were. The silverware lesson was written for them. I want my students to have a life where they think, “I can do that.” I want their secret thoughts to be positive. Writers write, drawers draw, eaters eat, painters paint, runners run. Then I taught them how to draw an egg. Actually, I didn’t teach them how to draw the egg, I taught them how to look at it. I teach them how to see. I want them to see that they are good. And what they draw is good. The drawing in front of them is the drawing that has value. Their drawing has to look like what is in their brain. It doesn’t have to look like the egg or the drawing of the teacher’s egg, or their friends drawing of an egg. It is their egg. And it is good. Tomorrow I will show you how to look at an egg. Stop saying, “I can’t draw.” If you can eat, you can draw. It’s your art. Don’t worry about what people think.